'Pataphysics, as you know, is the science of the exception; hence of the unexpected. Well, in a way; because clearly one is looking for the unexpected. 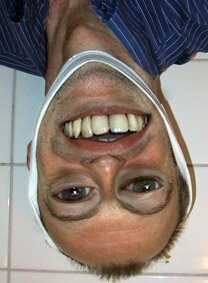 The brain habituates itself to the expected, it is the dangerous unexpected towards which much of its cognitive apparatus is geared. The brain, indeed, dreads the unexpected and has to be ready for it. Brains that did not "attendre l'inattendu" would rapidly fall prey to the motorised lawn-mower of evolution. One hears the clock stop ticking. In fact it is possible to argue the reverse of the Monty Python case that "NO ONE expects the Spanish Inquisition! ": as Kant famously said, "Ich erwarte keine spanische Inquisition" - but we now know that he was - rarely for him - being ironic and that of course that was precisely what he expected. If one expects the unexpected, and is justified in so doing because the unexpected not infrequently happens, then surely it is the expected that causes one, so often, to be surprised, as are smokers by their lung cancers. Did Joan expect Maxwell's silver hammer? Well, we know that she was "…quizzical/studied pataphysical science in the home" so it is extremely probable. 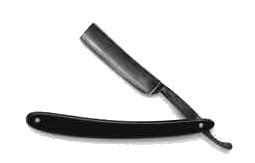 Occam's razor tells us that the simplest solution is likely to be the more elegant, that one should "shave off" extraneous bits of theory in the interests of parsimony. For example, outside of mental aberration it is simpler, and more elegant, and more likely to be true, that it was not god who created the world complete with fossils not very long ago. Quantum physics, of course, puts us in a bit of a quandary. Let us simply assert, with Derrida, that it is possible for an object (or, more generally, an event) to be both expected and unexpected; the waveform collapses down to - incredibly! - a paradox when examined. For if it be the one, then it is surely the other, and vice versa. It is for the above reasons that the Paris-based Collège de 'Pataphysique has so very many subcommittees, and strives towards the pure (what would in lesser hands be bureaucratic) state of targeting every possible exception with its own subcommittee. The problem here is of course encapsulated by Gödel's theorem, which (vulgarly) states that there will always be a surprise. This should not surprise us. I expect to be surprised, and am rarely disappointed. International Women's Day - a Modest Contribution & BEAKING NEWS:!:!:!:!:!:!:!:!:!:!:!:!:! Pyongyang, March 7 (KCNA) -- The people love to sing songs carrying the pride and self-confidence of the women on the general advance towards the high eminence of a great, prosperous and powerful socialist nation. 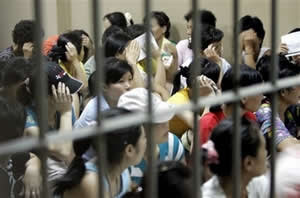 The song "Love your wife" calling for respecting the women socially is popular among the people. There are many songs showing the spiritual world of girl-soldiers in the "Persimmon tree company "," Wild flower Company" and other military units. Among them are the songs "Song of coast artillery-women" and "I am a girl-soldier in Songun era". Reflected in the songs "I am a wife of sentry" and "I am an officer's wife" are the noble ideological sentiment and revolutionary optimism of servicemen's wives who are doing their best for their husbands defending the country devotedly. The songs "A girl riding a swift horse", "Girls in our factory" and "A girl silk-weaver in Nyongbyon" sing of the fruitful working life of the women who are distinguishing themselves in the economic construction along with men. And the songs "Women are flowers" and "Song of wife" reflect the women's pride of creating the happiness of the families as dear wives and good mothers. The songs touch the heart-strings of the people. 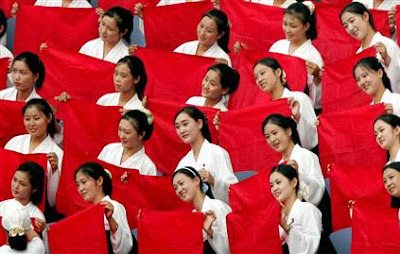 Today the Korean women love to sing these songs created in the Songun era and are doing their bit in the efforts for building the great, prosperous and powerful socialist country. Pyongyang, March 8 (KCNA) -- The news that the "International Kim Il Sung Prize" Council awarded the "International Kim Il Sung Prize" to Kim Jong Il on the occasion of his birthday has stirred up the hearts of the progressive humankind. 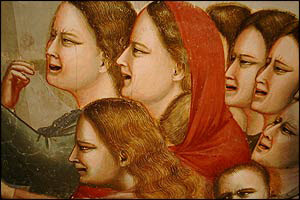 Being in a mending mood (the feminine side of Zombies is no less real nor undead than the male...) one wants to efface the tears, those very first ever, primordial ones painted by Giotto on the faces of the mothers in his Massacre of the Innocents. The start of art, they say. 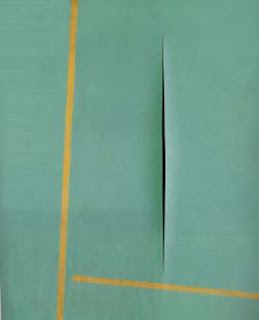 And then, in the mood, and following the lead of the late Aline Gagnaire, of OuPeinPo, giving Lucio Fontana's wife a break and stitching up his slashed canvas Concetto Spaziale, Attesa 1964. There's just too much, you know, emotion around.